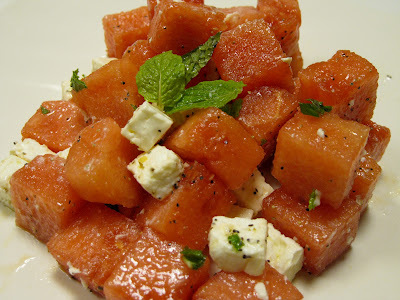 It’s Melon Madness at work this month and I’m tasked to introduce two deli-appropriate summer salads. I’m obsessed with this salad at the moment. Chunks of feta and watermelon are set ablaze by bright mint and tangy white balsamic. If you’re not a vinegar lover, lemon juice is a great substitute. Serve alongside simply BBQ’d chicken with grilled lemon and summer bruschetta. Foodie note: I hit the produce department for already cut watermelon, cutting it into even smaller 1″ chunks. A 16oz container made enough salad for two. If serving a larger group, get into a whole melon and serve remainder sections for dessert or breakfast. That said, this salad is not as good the next day (which I never say!). The watermelon begins to break down so it’s not very crisp. I’m funny about fruit texture… maybe you won’t be as finicky. Julienne mint, prepare all ingredients; combine and toss gently. Serve chilled with whole mint leaves as garnish. Love the simplicity of this recipe. It sounds delicious. I am a big fan of white balsamic, so this is right up my alley! Yum. It's a little brighter and won't make the salad look unnaturally brown; thanks for taking the time to comment! ← Is That A Corn Cob In Your Purse?